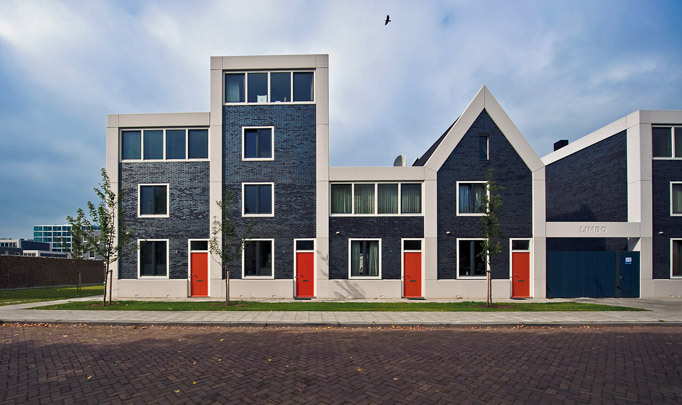 This housing project is the first phase of a restructuring programme for the post-war district of Holtenbroek. Units are held in large precast concrete frames that continue as garden walls. Fleshed out with black and white brickwork and square windows, these frames bring architectural unity to the ensemble. The flat and sloping roofs are a means of identifying individual dwellings. All units give directly onto a public green zone inaccessible to cars. For the sake of privacy, living areas are raised 60 centimetres from the street or given a modest front garden. All parking is in a courtyard invisible from the street.